From our lines of fixed and variable displacement pumps to our high pressure cartridge valves, we have the answer. 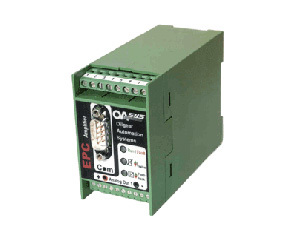 Oilgear engineers its Electronic Controller and other electronics to control your components; hydraulic or otherwise. Along with pumps and electronics, Oilgear also manufactures a line of rugged Flow Meters for applications in the harshest of environments. Hydraulic system performance has always been linked closely to the quality and cleanliness of the fluids being used. Oilgear's advanced hydrodynamic bearing design was created for use with environmentally-friendly fluids, such as water or water glycol. 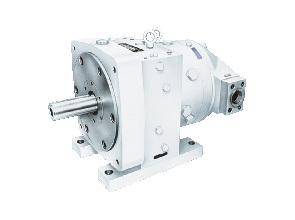 This technology was engineered to produce industry-leading efficiencies as new challenges occur..
Our range of Variable Displacement Pumps are some of the most reliable on the hydraulic market. We offer a wide range of displacement ranges, pressure ratings, speed ratings, and types of mounting configurations to meet your needs. PVM Pumps - "Super Hero"
Displacement: 0.66 to 7.94 in^3 / rev. 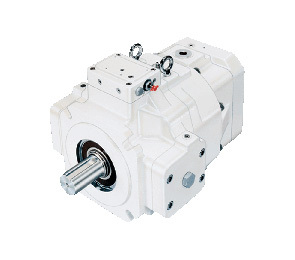 Mounting Configuration: SAE "A", "B" & "C"
Virtually indestructible, PVM open loop, axial piston hydraulic pumps by Oilgear offer advanced engineering and value at an affordable price. 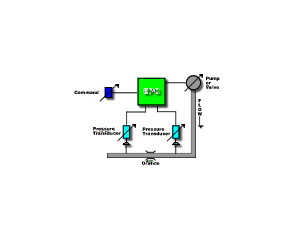 Computer-optimized and with multiple controls available, PVM pumps deliver high performance in a compact design. Available in three frame sizes with multiple displacements, durable PVM pumps feature Oilgear's advanced "hard-on-hard" rotating system that provides a higher degree of contamination resistance, allows for higher pressure operation, and increases the pump's lifecycle. PVWJ Pumps - "Smooth Operator"
PVWW / PFWW Pumps - "Versatile Performer"
Displacement: 0.86 to 7.94 in^3 / rev. PVWW and PFWW Pump are THE pumps to use for medium applications using low viscosity fluid. Our pumps provides the cooling fluid for the drilling operation, the system pressure changes due to the diameter of the passage they are drilling. The PVWH and PFWW series of pumps has a three-way control and the most reliable method of remote pressure control is by venting the load sense control module. 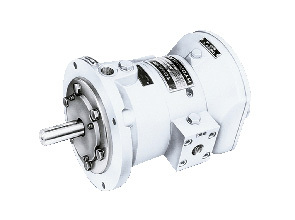 These Pumps have a speed capacity of 1800 rpm-electric motor. PVWC Pumps - "Tough Guy"
Displacement: 0.66 to 1.35 in^3 / rev. Mounting Configuration: SAE "A" & "B"
Rugged and tough, PVWC closed loop, hydrostatic axial piston hydraulic pumps by Oilgear offer low horsepower for high-performance applications. 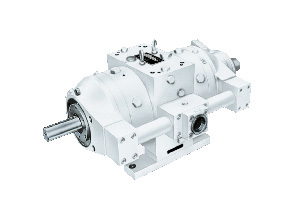 Designed around Oilgear's proven rotating group, the PVWC pump combines quiet operation, high efficiency and competitive pricing in a compact design. 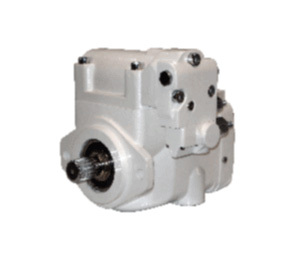 PVWC pumps feature a large line of controls with several types of mechanical, hydraulic, and electrohydraulic servo valve controls which permit easy field interchangeability. With three capacities per single frame size, PVWC pumps allow users to select their required level of capacity and pressure while providing maximum control rance and sensitivity. Capable of operating with low-viscosity or other special fluids, and with excellent contamination resistance properties, PVWC pumps feature a hardened cylinder surface running on a hardened valve plate, and pistons that run on a hardened swashblock surface. PVG Pumps - "Speed Demon"
Displacement: 2.93 to 7.94 in^3 / rev. 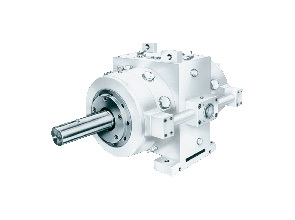 Mounting Configuration: SAE "B" & "C"
PVG open loop, axial piston hydraulic pumps by Oilgear offer high-pressure and superior performance in a compact design. PVG pumps provide an almost instantaneous response to system commands through a high-response four-way pilot-operated control - a first for this size and price of pump. 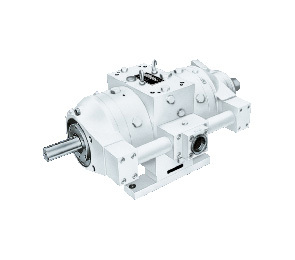 Available in multiple frame sizes and five displacements, high-performance PVG pumps feature Oilgear's advanced "hard-on-hard" rotating system that provides longer operational life, resistance to contamination, and allows for operation with low-viscosity or other special fluids. And, its unique hydrodynamic bearing support on the cylinder barrel contributes to the pump's compact design. PVV Pumps - "The Champ"
Displacement: 12.2 to 33.57 in^3 / rev. Designed for power and speed, PVV open loop, axial piston hydraulic pumps by Oilgear deliver the punch that is required for large, heavy-duty systems. Utilizing advanced engineering, the PVV pump line now delivers up to 560 horsepower - four times the horsepower at approximately one-third the cost of previous models. Computer-optimized for maximum performance, PVV is compact in design and available in three displacements. PVV pumps offer a large selection of controls that are readily interchangeable. With improved high-response controls and reduced noise levels, the rugged cylinder design of the PVV pump enhances optimal performance. The patented design of its pressure lubricated swashblock offers high performance for high-cycling operations, and contributes to the pump's ability to run on low-viscosity and other special fluids. 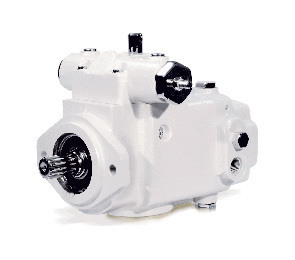 When you need a Fixed Displacement Pump, Oilgear is there to help. Choose your displacement ranges, pressure ratings, speed ratings, and types of mounting configurations. 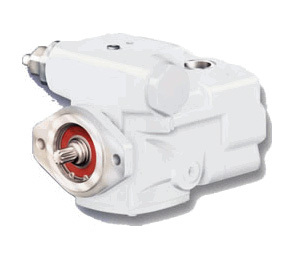 Oilgear's pumps are designed to last longer, and consume less energy. PFBA Pump - "Compact Brawn"
Displacement: 0.136 to 0.835 in^3 / rev. PFBK Pump - "Brute Strength"
Displacement: 2.13 to 4.17 in^3 / rev. PFCM Pump - "Robust Force"
Displacement: 4.26 to 8.34 in^3 / rev. PFCS Pump - "Dominant Force"
Displacement: 26.85 to 35.39 in^3 / rev. PFWH Pump - "The Invincible"
There are a lot of good reasons to buy a PFWH Pump: 10 different sizes on this product so that you can select the pump rated to precisely match your design requirements, No need to buy a pump that is too big, too costly or overrated for your applications. By acquiring this pump, you’ll be able to improve the performance control. Oilgear has been an industry leader in the use of infinite life sleeve bearings that run on a wet film. Pressure lubrication to these bearings assures smooth control performance with better compensating stability, reliability and repeatability. A special hardening process is also applied to the control bores, which means you can maximize the cycling capabilities and double or triple the life expectancy of the control. Moreover this pump is very quiet: less than 80 dBa at all pressure. But the most important is that these pumps are manufactured by Oilgear, a world class company well known for high quality products. Oilgear offers a complete line of standard, as well as special fuinction valves that are unmatched in performance, speeds, pressures and flow range. We also provide custom design flexibility at standard hydraulic valve prices. The cartridge valve concept is the modern approach to hydraulics and is utilized in increasing numbers of installations, as hydraulic engineers become aware of its design flexibility, excellent performance and substantial savings. Multiple valve sizes and functions are available for selection to exactly meet your system's design requirements for flow, pressure and/or poppet logic operation. 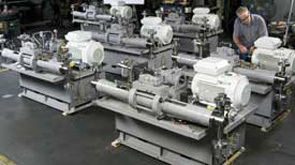 Valve lines include Prefill Valves, Check Valves, Directional and Regenerative Valves, Accumulator Discharge Control Valves, Flow Control Valves, Proportional and Servo Valves, Pressure Control Valves, Flow Shut-off Valves, Cartridge Valves, Isolation Valves, Anti-Recoil Valves, and Seven-valve Pressure/Flow Control Manifold Assemblies. Size: 1/16" - 5/16 "
Oilgear has a tremendous experience in high pressure products. Since 1921 we developed a line of products specialized in high pressure applications such as or fixed pumps and prefill and exhaust valves. Based on this experience Oilgear is known internationally as a class hydraulics company. Please check or high pressure line of products to realize what Oilgear can do for you. Choosing Oilgear as a supplier allows your equipments to run with the right components for specific needs. 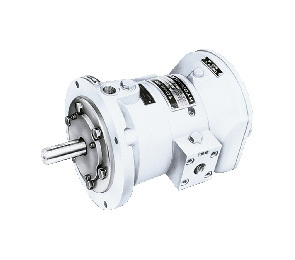 Oilgear's MFW and MVW fixed and variable displacement bi-directional high-speed motors are offered in two frame sizes and four displacements, allowing for greater flexibility to match pressure and capacity. 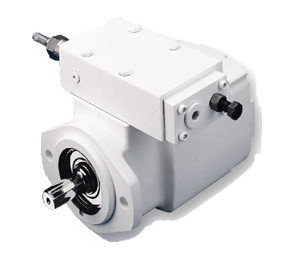 The MFW fixed displacement motor maintains constant torque with varying horsepower. Because the motor is fixed, maximum torque is available at all times when in operation, whether the motor is stalled or operating at full rpm. Horsepower output is approximately proportional to speed, making it is possible to reduce pump delivery when stalled, or bring the motor and load up to speed while maintaining full torque. 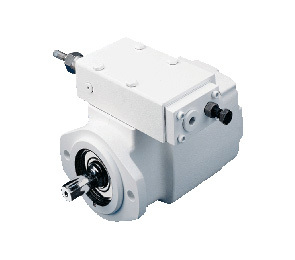 The MVW variable displacement motor can operate with constant horsepower and variable torque, or with constant torque or constant horsepower. When operating with constant horsepower and varying torque, the MVW motor can adjust speed over a 4:1 range when driven by a fixed delivery hydrostatic pump. 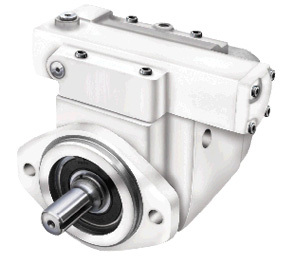 When a variable displacement motor is driven by a variable delivery pump, constant torque or constant horsepower at variable speed can occur. 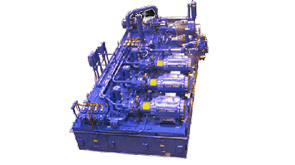 Oilgear has been providing hydraulic power units (HPU) to the world since 1921. Our power units are supplied to OEM’s for new equipment as well as end users to upgrade or retrofit an existing system. 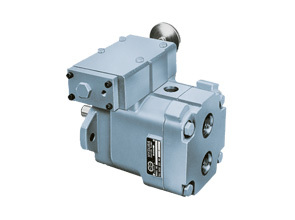 They can be found in almost every application that requires hydraulic power. A well designed reservoir will be sized and properly baffled to eliminate turbulence, aeration and temperature problems. Oilgear engineers will work with you to define system requirements to determine proper capacity and ensure the unit meets your space and performance specifications. 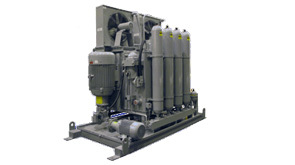 A complete HPU includes the reservoir, pumps, motors, oil cooling and filtration systems, and necessary valving or manifolds. Pumps can be mounted on the top or side of the reservoir. Vertical and in-tank mounting configurations are also available. 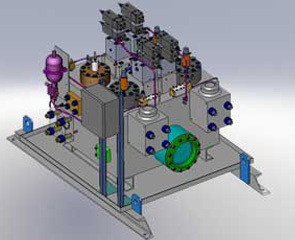 Systems can be designed for special fluids or unique environmental conditions. 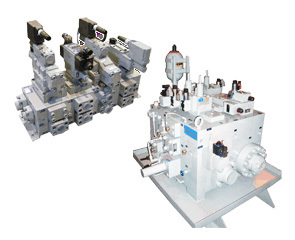 Large or small, custom or standard, single HPU or multiple system applications Oilgear can provide the hydraulic power unit you can count on to perform reliably for many years to come. 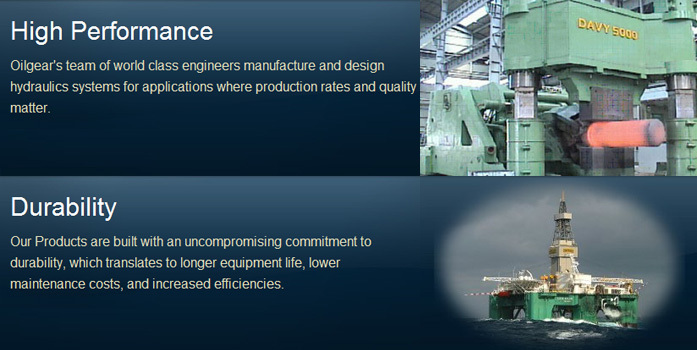 Oilgear has built a reputation upon the superior engineering and unbeatable reliability of our solutions. As a result, our modular and integrated manifold systems are in use worldwide for a wide variety of different applications. Our understanding of manifold design and manufacturing has allowed Oilgear to innovate many essential advantages such as reduced size, weight, and cost. Our high quality and reliable systems provide a clean and leak free solution to our customers’ most challenging control system problems. By using the latest available software modeling techniques you can trust that your manifold will exceed your expectations, no matter how big or how small. When you purchase a manifold from Oilgear, you are getting the experience and dedication of thousands of engineering, design, and testing hours from the country’s best and brightest engineers. Our specialization in the manufacture and design of hydraulic automation and components has given us the knowledge required to make any application more efficient. However, our most important company-wide mission is our flexibility to your application. Our engineering team uses the latest tools such as Solid Works and PDM Works to design and analyze each new application to maximize block utilization and reduce system pipe runs. Oilgear has manufacturing facilities in the U.S., Europe, China and India to supply manifolds anywhere in the world. 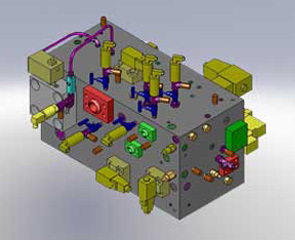 We can provide small single-function units or manifolds weighing up to 50 tons. All manifolds are assembled and tested in our facilities. One of Oilgear’s strengths is the company’s ability to design and build Custom Engineered Products – whether it’s high pressure reciprocating pumps for use in the chemical or oil industry; transfer barrier pumps used in the steel or forging industry, or ultra high pressure valves used by the military, Oilgear is always ready to work with our customers to provide unique products that meet their requirements.